Skeleton Costume Ideas: Skeletons are a favorite for Halloween costumes, and making one yourself can be pretty easy if a little time spent. We’ve gathered the best skeleton DIY instructions for you so you can find what you need. 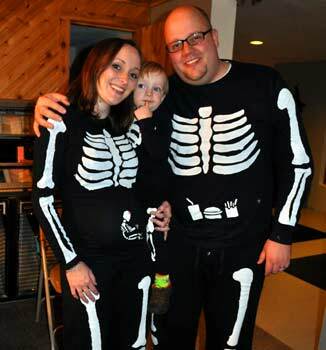 From babies and toddlers to adults and even dogs, you’ll be able to go as a whole family of skeletons. 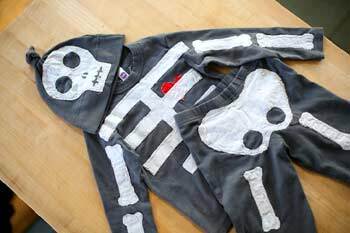 This painted skeleton costume by tumblingblocks uses freezer paper to create the template for your bones. 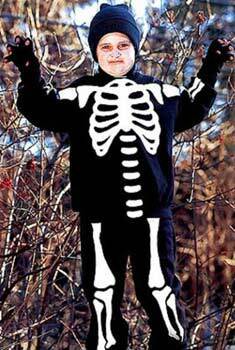 Like most skeleton costumes, you’ll need to start with a comfortable base layer in black. 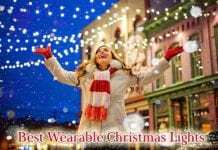 Make sure you get a long-sleeve shirt and full-length pants. You’ll start by putting on the top and pants so you can measure where the bones actually are in the person wearing the costume. After you draw and cut out your bones from the freezer paper, you’ll iron it (wax-side down) onto the clothes and then paint in your bones. The freezer paper will peel off easily, leaving perfect outlines of your bones. Finish it off with an outline in glow in the dark paint, and you’re all set!. 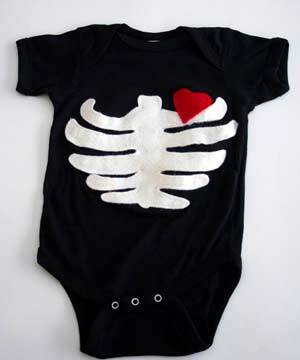 For the littlest skeleton in your dead family, this simple onesie costume will be perfect. In fact, this costume is so easy to make that the site included three different onesie costumes for you to choose from. There’s a printable template for you to use, and you’ll create the skeleton from felt. From there you can hand- or machine-sew it onto your onesie or even use fabric glue if sewing isn’t your thing. 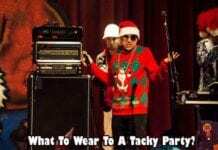 Bonus: they even include instructions for how to create a matching adult look!. 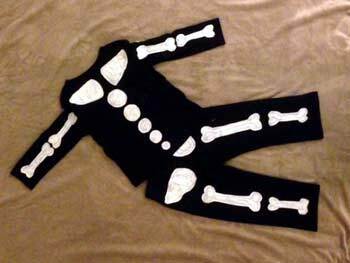 This embroidered costume by Ashley Weeks Cart offers a starting template to help with creating the bones. Freezer paper is used again, but this time the bones are drawn on freezer paper, cut out, and adhered to the fabric you want to use for your finished bones. You can then cut them out according to the stencil created by your freezer paper. This adorable toddler costume also includes a matching skull cap. Your dog is a part of the family, so of course, they should get to enjoy Halloween as much as the rest of us. These instructions by Catherine Holden Robinson include two different methods for creating a skeleton costume for your doggo. If your dog has short enough fur and will sit still long enough, you can paint a skeleton onto their fur. 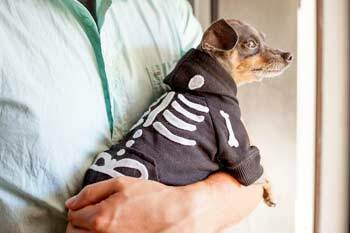 Since many dogs won’t love that process, you can also make a skeleton hoodie for your dog to wear. You’ll attach felt bones to the base hoodie using fabric glue to create a unique look for your dog. This toddler costume by Craft Passion is made for footed pajamas and offers a toddler-sized template and instructions for both an applique technique and a stencil technique. The stencil technique is covered in more detail and includes pictures of the materials used. If you can get some glow in the dark powder and mix it in with your acrylic paint, this costume will definitely stand out. Since it’s made using comfortable footie pajamas, you’ll also have a fun new pair of pj’s for your toddler after Halloween is over. 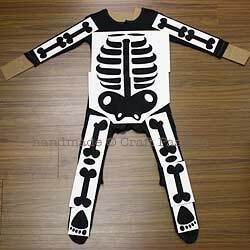 This skeleton costume by Country Living is designed with the older child in mind. It includes a pattern for your bones and a simple, homemade face paint recipe to compliment the look. Although you can use fabric glue to attach the bones to the sweats underneath, they recommend sewing it if you’d like to wash and wear the costume again. 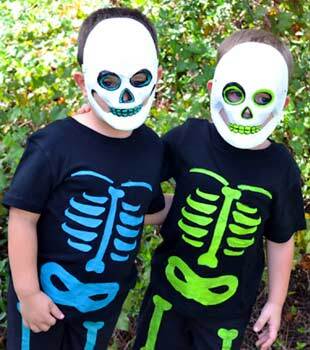 These brightly-colored skeleton costumes by Poofy Cheeks provide a fun twist from the traditional black and white look. A printable bone template is provided with full instructions on how to create your stencil and paint in a fun, colorful, and even glow in the dark skeletons. This toddler costume uses an old white t-shirt to create its bones, so if your toddler already has a comfortable black shirt and pants that can be sacrificed for the costume. The only materials you’ll need to purchase are fabric glue and glow in the dark paint (optional). 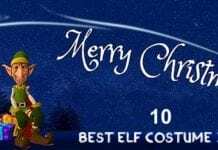 The best part of these instructions is that she goes into detail about how she drew out her bones on the t-shirt, so you have an easy and inexpensive way to create an applique costume. If you’re going to take the time to make a skeleton costume before Halloween, why not take the time on the day to create a matching makeup look? These detailed instructions include explainers on how to create a simple skull face or ramp it up into a more detailed look. A video tutorial is included for an impressive look that is sure to scare the neighbors. Halloween can be a challenge for pregnant women who still want to dress up but have more limited options. Enter the skeleton family, complete with skeleton baby-in-the-belly. This method uses the freezer paper template technique to paint in the skeletons, and it even adds a burger, fries, and soft drink to the Dad costume’s belly. 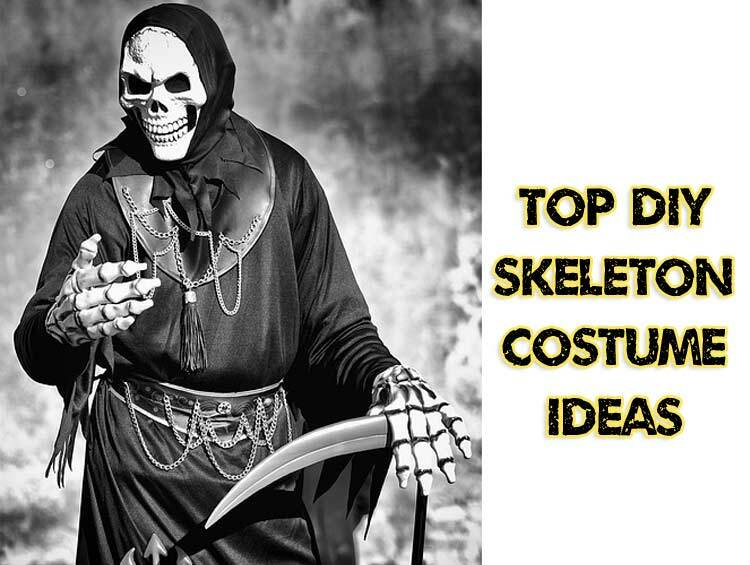 So, there you have it: the best DIY skeleton costume options on the Internet. Whether it’s just your child or the whole family dressing up, you’ll be able to make an inexpensive skeleton that looks amazing. Do you prefer the applique techniques or painted-in stencils? Let us know in the comments!